The Wavetek Meterman Heavy Duty (HD) 110B/115B/160B digital multimeters are built for harsh conditions. These multimeters are built of fire-retardant plastic. All sensitive components are shock-mounted. Waterproof construction prevents dirt and moisture from entering the case. 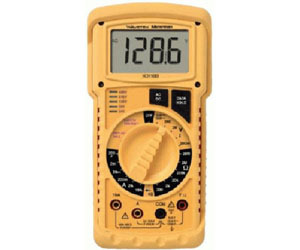 This series of multimeters has a feature that checks for live circuits, and indicates the presence of common power supply voltages (AC or DC, positive or negative). This multimeter eliminates the need for a separate voltage checker.